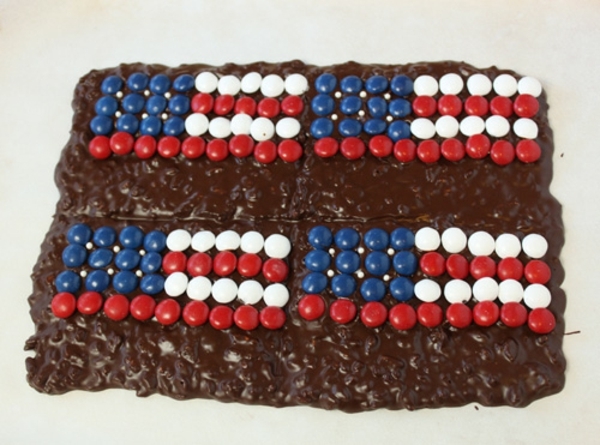 The Fourth of July is almost here, and what better way to celebrate than by making candy bar flags? 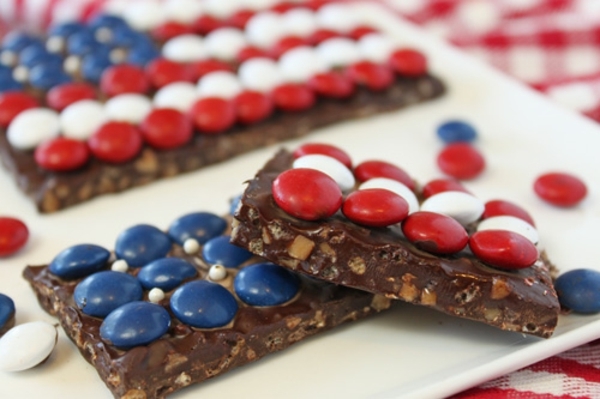 The chocolate in these candy bar flags is more than just a boring slab of semi-sweet–it’s packed with crunchy mix-ins like crispy rice cereal, toffee bits, or chopped nuts. 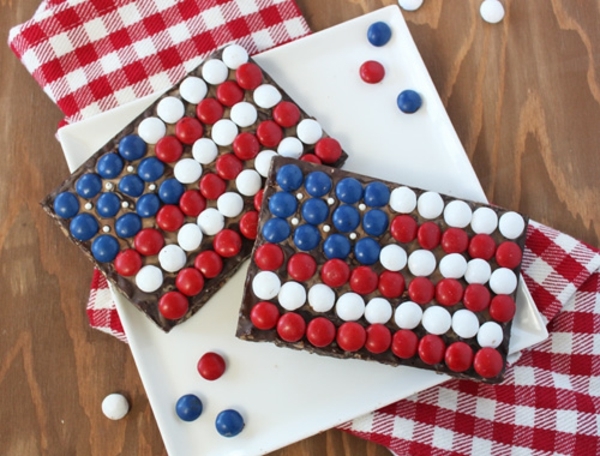 The flag design is made from red, white, and blue candies that add extra flavor and crunch. If you live in a country that doesn’t celebrate the Fourth of July, this idea can always be adapted with different colors and patterns to make a wide variety of flags! 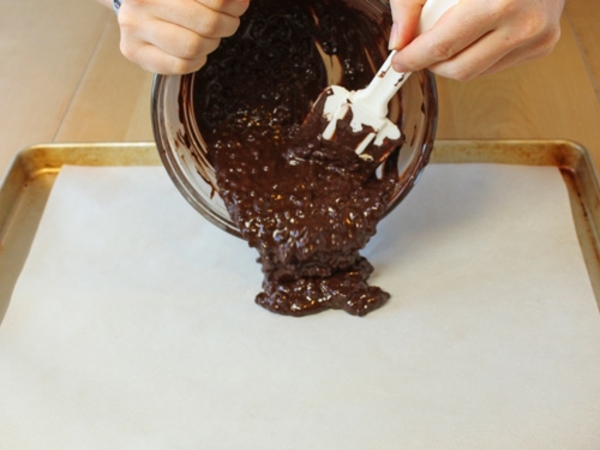 The first step is to prepare the chocolate. If you’ll be enjoying these Candy Bar Flags right away, or keeping them in the refrigerator, simply melting the chocolate is fine. Place it in a microwave-safe bowl and melt it in 30-second intervals, stirring frequently, until it’s smooth and lump-free. If you want to store these bars for longer periods of time at room temperature, I suggest tempering the chocolate instead. There are photos and instructions showing how to temper chocolate on last week’s Neapolitan Rocky Road Bark recipe. 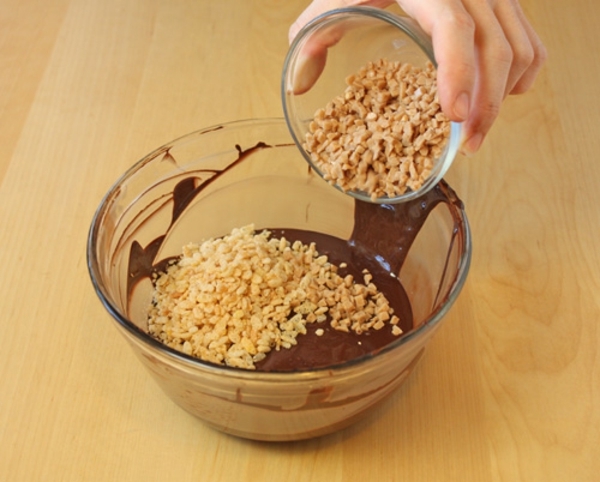 Once the chocolate is melted, add the crunchy mix-ins and stir them in. I used crispy rice cereal and toffee bits, but you can add chopped nuts, toasted coconut, or any other candy bar-friendly ingredients. 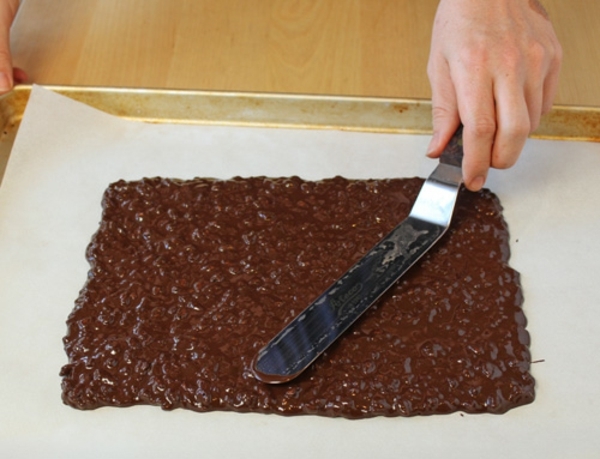 Scrape the chocolate mixture out onto a baking sheet covered with parchment paper, waxed paper, or aluminum foil. Use a spatula or a knife to spread it into a rectangle, about 10 inches long and 8 inches wide. It will be about 1/4-inch thick. Use a knife to mark the chocolate in half vertically and horizontally, forming four equal rectangles. 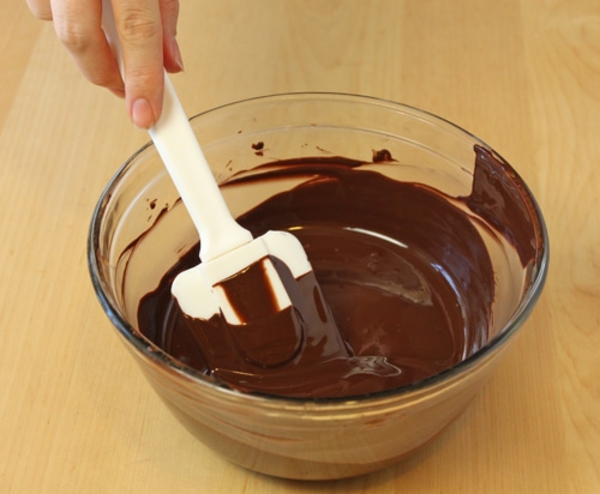 Since the chocolate is still wet you’re not actually cutting it, you’re just giving yourself a visual guide. 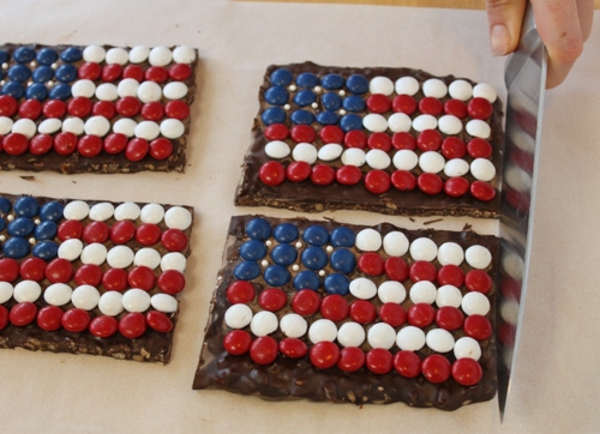 Once the flags are marked off, you’ll need to work quickly to add the candies on top before the chocolate hardens. 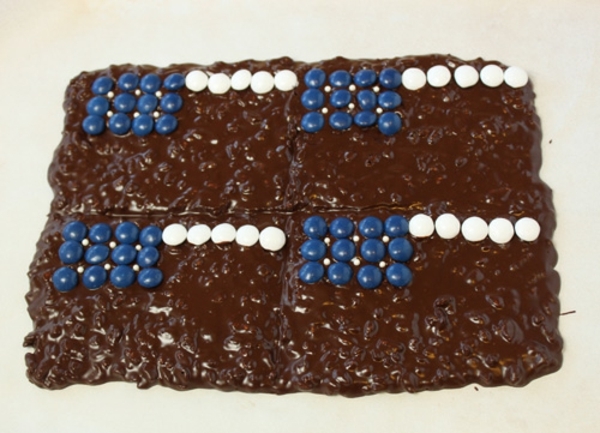 Leave a small 1/4-inch margin on the edge of each flag so that you can cut them into neat rectangles without cutting into the candies. 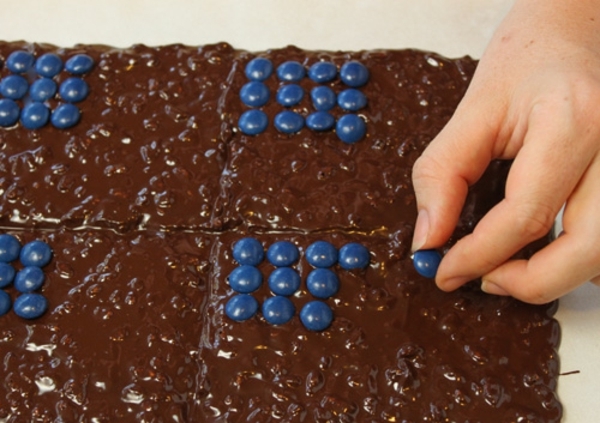 First, arrange the blue candies into a rectangle four across and three long in the upper left corner of each chocolate flag. 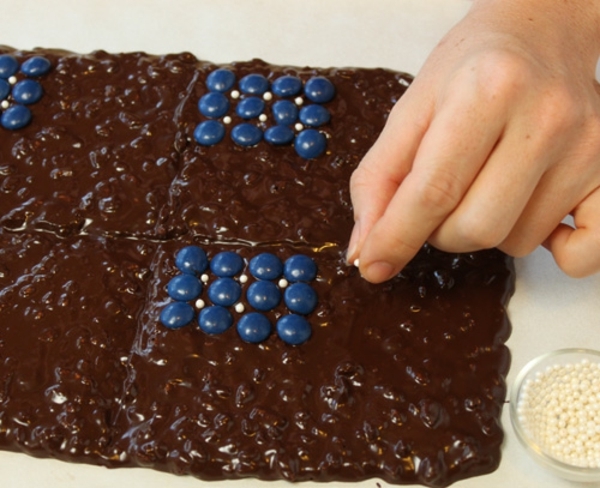 Drop a small white sprinkle into the space between each blue candy, to represent the stars. If you don’t have white sprinkles this step is optional, but I think it adds a nice touch. Add a row of white candies on top, going all the way to the end. Depending on the size of your flags,you should be able to fit four or five candies in the row. Add a layer of red candies underneath, keeping the same spacing for the candies. Continue to add rows of candies, alternating red and white colors. Continue until you’ve run out of room on the bottom of the flags. Don’t forget to keep a margin so you can easily cut them! If the chocolate hardens before you’re able to finish, melt a little more chocolate and place it in a plastic bag with a hole cut in the corner. 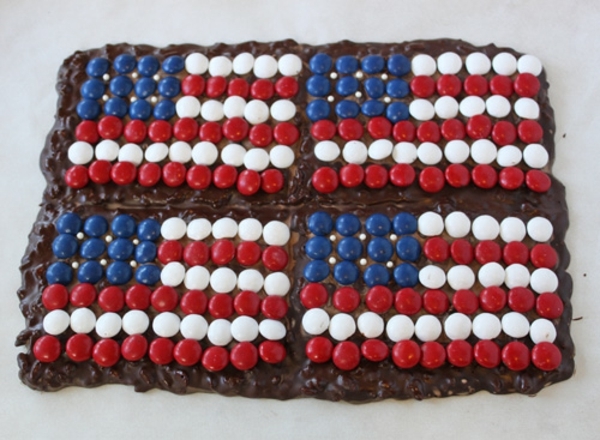 Squeeze a thin line of melted chocolate across the flag, and press the candies into the chocolate to adhere them. 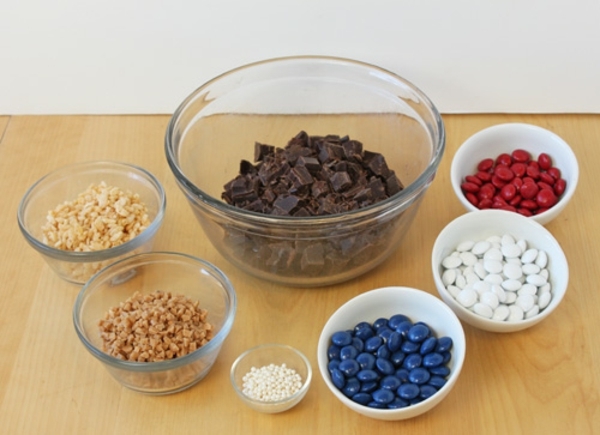 Once all of the candies are affixed to the chocolate, refrigerate the tray until the chocolate sets completely. Once set, use a sharp knife to carefully cut the uneven edges from the sides of the flags, then cut the flags apart from each other. 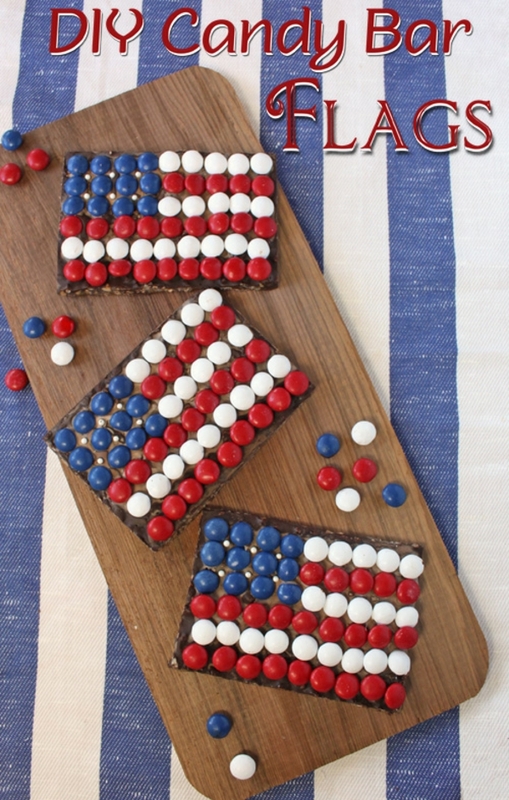 These flags make fun party favors, centerpieces,or edible decorations for your Fourth of July bash. Not having a party? They’re also a great kid’s craft, since they’re quick, easy, and full of delicious edible craft materials. 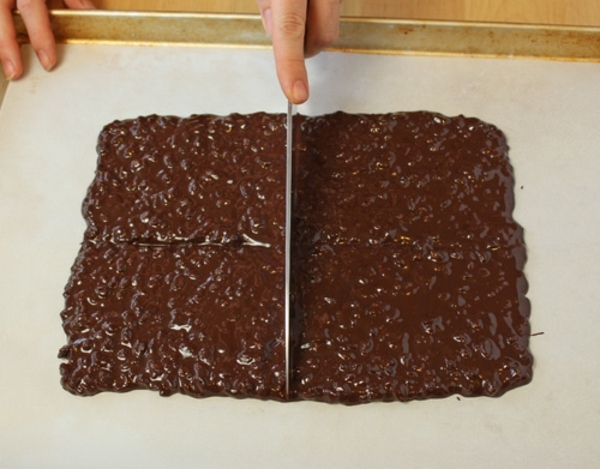 Passover DIY Chocolate Bars !